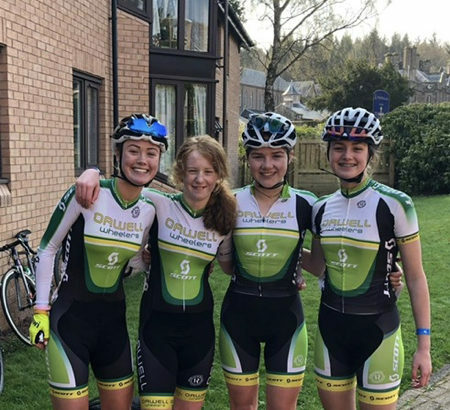 The Women’s Commission supported an Orwell Wheelers selection in the Youth Tour Of Scotland (April 5th to 8th) with our Rider Race Bursary . The Youth Tour of Scotland is Scottish Cycling’s flagship youth stage race event. The race takes place in the beautiful Perthshire countryside. 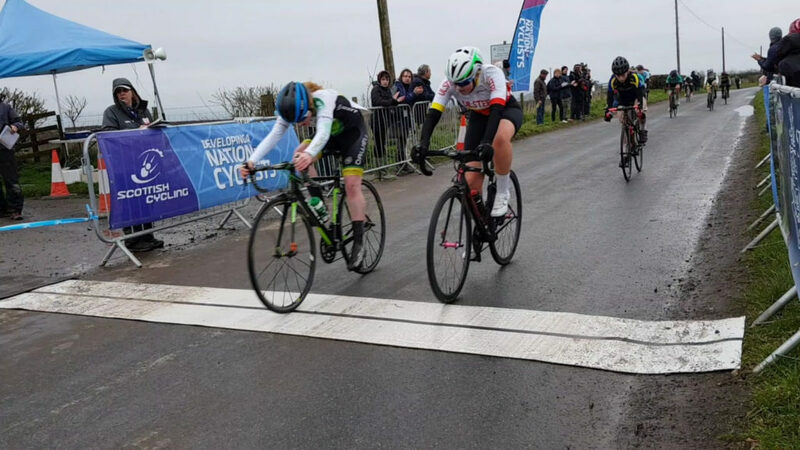 Read Rider Race Reports From Caoimhe May & Katie Reilly Below. “This year we left on Thursday afternoon rather than Friday morning which gave us an extra day of a holiday before being stuck into racing our legs off around Scottish roads. We got lots of laughs over the long weekend and really did enjoy ourselves. Being my birthday on the Thursday we had a mini celebration on the ferry with balloons which seemed to be a struggle for some to blow up as well as cake and of course your typical cringy happy birthday song! On Friday we rolled up to the very posh Strathallan school in our very professional team car and team van looking very much like the pros we are! We got out in our matching Scott Orwell wheelers hoodies and polo shirts and began our weekend of bike riding. The event was massive and organized in a way that really did make us feel pro. As a team event it was exciting to do our course recce as a group rather than on our own and riding past other teams in the sunshine. Sadly Friday was the most sun we got for the majority of the weekend and Saturday morning was not the most attractive weather to get me into race mode. So we signed on, got gears checked and pinned numbers on while we waited for my favourite stage to begin. Still pouring rain, freezing cold and grey, I still decided shorts and a short sleeved jersey would be wise to race in… The flag dropped and away we went on stage 1 of 4. An hour later finishing on the winners time I was chuffed but shivering rather a lot. The struggle of changing out of wet gear was real! However it was worth getting into warm clothes and back out to support the boys after being praised for our dedication to the team when most riders went back to accommodation. Dinner in the canteen with all other 159 racers followed by the presentation of stage 1 gave us quite a buzz. Sunday brought us more grey skies and not a whole pile of luck to me. We rode a strong team TT and got over a minute quicker of a time than last year as well as finishing with all 4 riders. Later that day I decided shorts and a short sleeved jersey was yet again a great idea however thankfully it wasn’t raining and not quite as cold this time around. Another hour later and I was across the line after winning my bunch sprint which was the second bunch to finish. I piled on the clothing layers yet again and went back out to support the rest of our team. Another race day – another session of presentations and not so tasty canteen food. Extremely tired meant early to bed to refresh ourselves the best we could before a very fast final stage- the kermesse. The skinsuit was whipped out and stabbed by pins for the very last race of the weekend! Typically the only race with sunshine being the last. Unfortunately I did not have enough in me to stay with the bunch and suffered – finishing 1 lap down on Zoe Backstedt who finished miles ahead of every else! After making a bet with Zoe before the weekend that she would more than likely lap me in that stage, I won the bet and got my only prize money of the weekend! Time came to pack up and say our goodbyes to friends both new and old and start our mega journey home. 4 hours of loud music, traffic and funny texts back and forward from our team van to the team car, we arrived at the ferry port with our well earned chipper chips! On the boat we reflected on what went well, what we learned and what we got out of the weekend and it was safe to say we all gained a lot from the experience of such a massive event. Finally, a huge thank you to everyone who helped us out and got us there and back safely! Thanks to: Scott Orwell Wheelers, The Womens Commission, our parents and in particular to Gen who made this all happen for us and who thought of absolutely EVERYTHING!! “I went to the UK for the Youth Tour of Scotland for my second time. When I was last there, it was a really big shock, the standard of racing is just so high over there with 80 of the top UK female riders including Olympic development riders and even a classic winner (Zoe Backstedt). This year I was a lot more prepared. Scott Orwell Wheelers had selected a really strong team this year, with Caoimhe May, Annie Roche, myself (Katie Reilly) and guest rider Aoife O’Brien from Lakeside Wheelers. Forteviot, long circuit road race (lap is 6.63km). We had to do 5 laps the circuit was really tough with a big hill. I did really well, I stayed in the front bunch for two laps of the demanding circuit. When I got dropped, I got into a bunch of about 5 riders. Two of the riders kept attacking while the rest of us just sat in. Slowly more groups and other stragglers where caught by our group. On the last lap one girl attacked on the steepest part of the climb. Slowly we were reeling her in. Coming into the finish it was a descent and I saw a gap and attacked. I caught the girl that had attacked on the line and won the sprint. The conditions were extremely tough with very heavy rain and at points there was even hail stones. The 2nd stage was a team time trial. I was really happy with it as I finished with team. We came 13th out of 20. St David’s, long circuit road race (lap 6.9). It was the same course as the team time trial we had 5 laps. The pace was really fast from the start. I got dropped when Zoe Backstedt attacked on the second lap. I got into a good group we were a small enough group that could just about see the group ahead (containing my teammate Caoimhe May). Unfortunately, there was a crash in my group and a few riders went down. In the sprint I came third which was really good for me. Strahallan, short circuit Kermesse race (lap 2.55). the girls had 10 laps. The Kermesse course was very narrow and technical and narrow with a steep hill (12% gradient) at the finish. The kermesse was really fast and fun it is a really nice course to finish the weekend on. Unfortunately, I had a mechanical and my front derailleur wouldn’t shift into the big ring which was grand for the hill but meant I couldn’t carry speed on the descent. Overall the weekend was really fun. the racing over there is completely different to what we have here in Ireland. I am really thankful for everyone that made it possible for me to go to Scotland. `Especially Gen, Una and Terry. A special thanks to Scott Orwell Wheelers and the Women’s Commission for their support”.